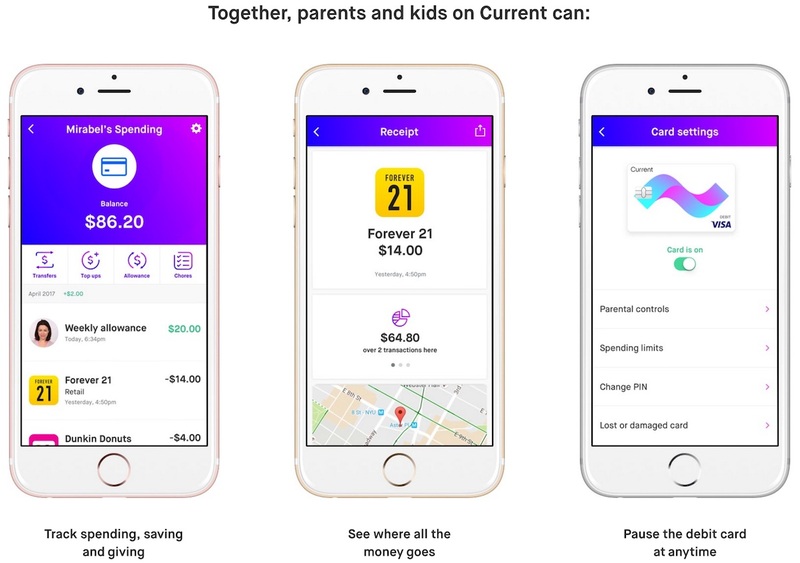 Visa has partnered with payments startup Current and today the companies are launching a new "smart debit card" and iOS app that aim to give kids and parents more autonomy and security when it comes to doling out spending money (via TechCrunch). The new Current card functions like any other Visa debit card, allowing teens and younger kids to spend money without needing cash, but comes connected with a parentally-controlled iOS or Android smartphone app. The Current iOS app [Direct Link] has two sides, for both parents and their kids. 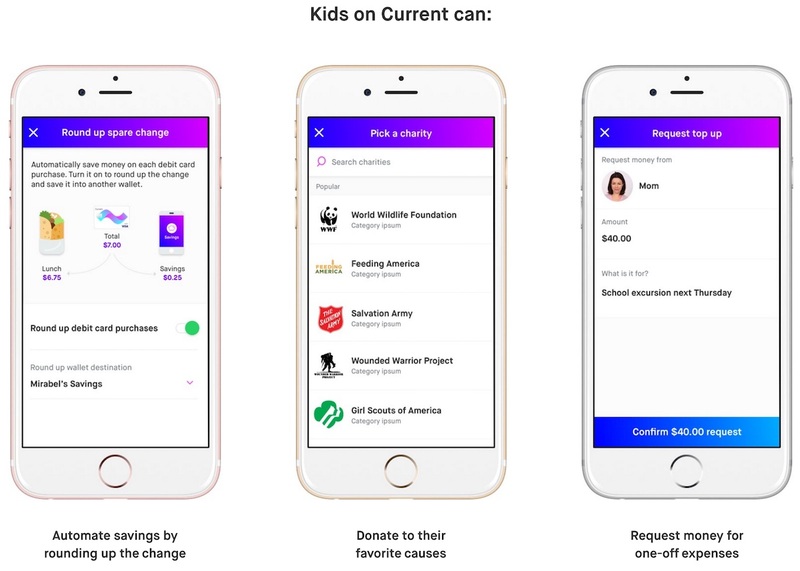 Parents can set up specific chores within the app, include a description, and set an amount of money that will be funneled into the kid's Current card, through the parent's connected bank account, upon completion. Automated allowances can also be set to recur on a weekly or monthly basis, and parents can block spending from specific businesses like casinos and bars, as well as set spending limits. The company said that its biggest inspiration was helping to streamline the weekly allowance hassle that parents have to deal with when their kids require money, which has traditionally been given in cash. With Current, you'll get your own debit card and an app with three smart wallets for spending, saving, and giving. Asking parents for money can be awkward, they don't always have cash on them and you have to go through this every week. Current automates your allowance so it arrives in your spending account when you need it. If you get stuck somewhere and you're out of money, you can get more from your parents instantly through Current. It's as simple as texting and the money will show up right away. On the kid side of things, once they are issued the Current card, they'll have access to three separate wallets for spending, saving, and giving. The spending wallet is directly linked to their Current card for day-to-day expenses, the savings wallet allows them to place part of their allowance into a safe place for later spending, and the giving wallet encourages donation to thousands of charities. The company said that all of the app's features will help to inspire "real world, financial education for kids." Current also works with Apple iMessages, Facebook Messenger, Kik, and a few other text services, so parents can send money to their kid's Current card through a text message. The company said that any bank in the United States can be added into the app, and an international expansion is "in the works." Multiple subscription plans are available for parents interested: $5/month for a month-to-month subscription with an additional $5 charge for the debit card; $3/month for a 1-year subscription and a free debit card; and a $2/month for a 2-year subscription and a free debit card. The latter two subscriptions are billed upfront at the start of each billing period, meaning $36 and $48 are charged every year and every two years, respectively. Bank transfers, payments, and in-network ATM usage have no additional fees, but replacement cards cost $5. More information about Current, including security and privacy features, can be found on the company's website. Once parents sign up and make a Student Account for their kids, which requires a social security number, Current will issue the Visa debit card to the designated address. Those without kids can also sign up for Current's free-to-use individual wallets, which function like traditional mobile payment apps and allow for peer-to-peer payments among friends and family. Looked neat ... right up until the word "subscription". Nope. Totally uninterested. Fees? Nupe. I have my kids each with the Square Cash app, that uses ApplePay and a fallback to a free Bank of America student account. Soon Square will have physical debit cards, and perhaps Apple will intro P2P payments. Best of luck though, Visa. I trust my kids with cash that wife hangs onto. Kids don't need a card. Teach kids to count and manage cash money. Less likely to get suckered out of it. My 9yr old has already figured it out. I don't let my child to go nightclubs or gamble. But book a hotel and airplane? Yup.